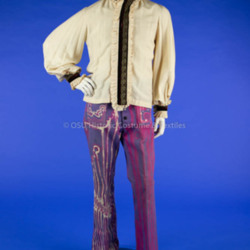 Purple/pink canvas button fly jeans painted all over with bleach designs, patch pockets, black buttons. 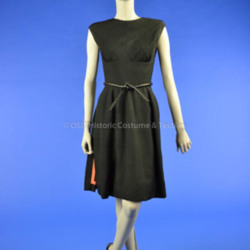 Signed by artist on inside waistband. 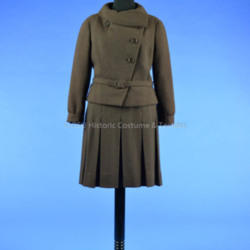 Brown wool boucle suit; belted short jacket with rolled collar, pleated skirt. 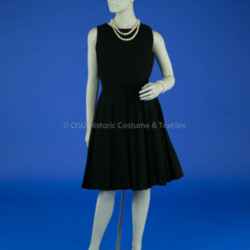 Skirt has five 1 5/8 box pleats on front and back opening at hip level. 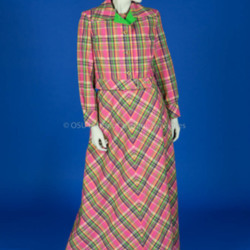 Bright pink, purple, lime green, and orange seersucker plaid jacket dress/summer ensemble. 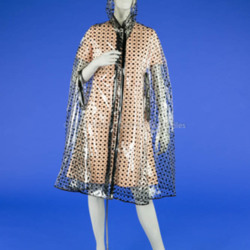 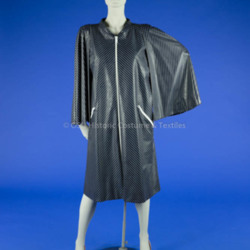 Clear plastic rain cape with black dots and black trim at arm slits, front opening, collar and hem; four snap closures on the front; vertical slash openings for arms at side fronts; detachable snap-on hood has black trim around front edge. 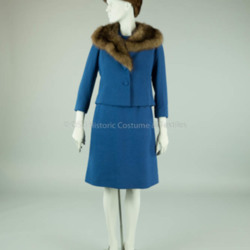 Blue wool dress and jacket with fur (fox or raccoon) shawl collar.